← Week 11 – The Future, again – Can we still call say “Media” or Communications” and mean what we used to mean? 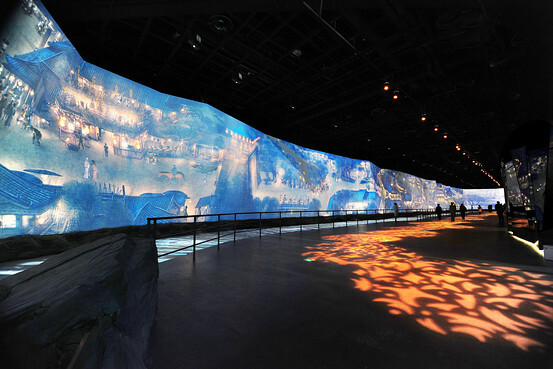 During the Shanghai World Expo last year in 2010, a thousand-year-old art masterpiece, “Along the River During the Qingming Festival “ by Song Dynasty artist Zhang Zeduan (1085–1145) was remade into an animated version as one of the major exhibitions of the China Pavilion. This re-made version is 130 meters long and 6.3 meters high, which is the 30 times of its original. Designed by modern media technology, the animated version of the old painting varies with change of lights and movements of figures. One section of the original "Along the River During the Qingming Festival"
I can’t say this artwork is a masterpiece. Yet, by its impressive combination of new media technology and traditional artwork, I reckon this remade version is probably one of the best showcases of New Media Art. However, you may wonder, what is New Media Art? New Media Art can be described as a “catchall phrase” that refers to an area of artwork that includes new media technologies like video, the web, sound and, on occasion, film and photography as well. Over the past two decades, as digital technology became more mature and affordable, the production of new media art is considered by many artists as more creative, innovative and economically viable.Yet, some people may criticize that, new media art is a kind of like a loose categorization of media as it doesn’t have a clear definition or position like some ‘traditional’ media, such as painting and sculpture. In my own point of view, the remade of “Along the River During the Qingming Festival “, is not only a new media artwork, but also a cultural revival of China’s. Over the past two decades, the Western culture has spread out in China because of the contraflow of media from the Western countries, like the United States. Some people may even reckon, the western culture, based on individualism and mediated primarily thought, is undermining their traditional values, as well as their culture. However, by a minglement of new media technology with traditional media art, China has successfully shown the world its real culture during the World Expo 2010. I believe that, more people will be interested to investigate, explore and appreciate the Chinese culture again when this new media artwork displays at different parts of the world in the future.